Hammer at TechCrunch in July 2008. 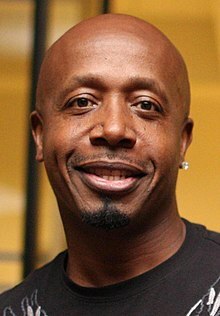 MC Hammer (born Stanley Kirk Burrell on March 30, 1962) is an American rapper. He was popular in the late 1980s and early 1990s. Hammer is known for becoming very rich and well known in a short period of time. His fame and money did not last long though. He lost it all in a very short period. Hammer was also known for the pants he wore. "Hammer Pants" became a fashion trend while he was popular . He became a preacher in the 1990s. Hammer now works as a television host and CEO. Hammer was a contestant in the first season of The Surreal Life. Hammer is a Democrat and attended the 2012 Democratic National Convention in support of President Obama's re-election. 1995 "Straight to My Feet"
↑ Tran, Vivyan (September 7, 2012). "Celebrities spotted at the Democratic National Convention". Politico. This page was last changed on 15 May 2018, at 12:52.